Former City Councilman Sala Udin was among the 8,000 residents and businesses in the lower Hill District who were displaced in the 1950s for construction of the Civic Arena. 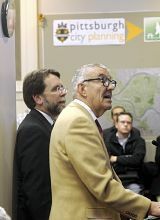 On Wednesday, he urged Pittsburgh’s Historic Review Commission to reject a push to grant the arena protection under the city’s historic structure preservation law. During more than four hours of testimony, preservationists said that the arena’s distinct domed shape, its engineering and its place in the fabric of Pittsburgh’s history should spare it from a wrecking ball. The city-county Sports and Exhibition Authority, which owns the building, and city Planning Commission have voted to demolish the building. The SEA had hoped to start in April, but the nomination for historic status has delayed that. “It is the branding image for Pittsburgh, right under our noses,” Toker said. A 2007 agreement between the Sports and Exhibition Authority and the Pittsburgh Penguins gave the sports franchise development rights for the 28-acre site. Various representatives outlined a long-term redevelopment plan — one in which the arena is leveled — to make way for residential, retail and commercial development, creating thousands of jobs and millions of dollars in tax revenue. City Councilman R. Daniel Lavelle, who represents the Hill District, said there’s no redevelopment plan for the arena itself. The city rejected historic status for the structure in 2002. The Historic Review Commission could make a recommendation next month; the city’s Planning Commission and City Council still must consider the request, a process that likely will stretch into summer. The city’s Historic Review Commission will allow the president of Iron City Brewing Co. to tear down a dilapidated building at its former Lawrenceville production site. The commission on Wednesday said Tim Hickman should provide it with photographs and other documentation of the 1,900-square-foot building for its records, but otherwise can proceed. 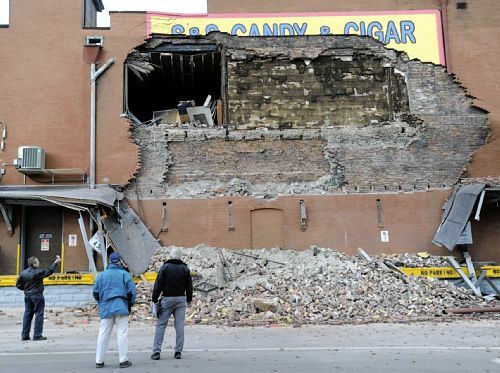 The city’s Bureau of Building Inspection cited the brewing company because of the distressed state of the building, but the site’s historic status — granted by the city last year — had complicated the issue of razing the building. Commission acting chairman Ernie Hogan said state officials indicated that tearing down the former pipe shop shouldn’t interfere with the historic status or development tax credits. Hickman said the site could be developed for light industrial use and industrial warehousing. Iron City moved production from Lawrenceville to Latrobe in 2009. Hickman will have to talk to the commission next month about taking fermentation tanks out of another building. Hickman proposed removing two walls to do so; he said the building is useless with the tanks inside. Also, Hickman has an agreement with the Pittsburgh Water and Sewer Authority to use the proceeds of the tanks’ sale to settle a billing dispute dating to 2007. The Denis Theatre Foundation on Wednesday named Valerie Golik, the former executive director of The Pittsburgh Philharmonic, as its new executive director. She replaces board member Jennifer Smokelin, who has served as interim director since the fall. When Ms. Golik, of Marshall, assumes the role Jan. 17, she will direct the foundation’s goal of restoring and re-opening the Denis Theatre on Washington Road in Mt. Lebanon. The theater, which opened in 1938, closed in 2004 in a state of disrepair. The nonprofit Denis Theatre Foundation formed in 2007 and began a fundraising campaign, with the goal of purchasing the building and restoring it as an independent film theater and community cultural center. 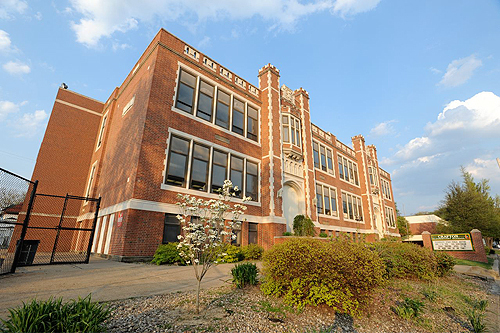 In September, the foundation announced it had raised enough money to purchase the building. Ms. Golik will assist with the capital campaign to raise $2.5 million to open the first of three planned screens. So far, the foundation has raised $900,000. The foundation hopes to open the first screen in mid-2012.